Join us on paths less travelled to discover the true heart of Fiji. Fiji is famous for its corals and coast, but we will take you on a journey away from the tourist resorts and walking in a landscape of dramatic peaks, pristine forests, sparkling rivers, remote villages, vibrant traditional culture and unique history. Please read the following information so that you can understand what to expect from this trek. Should you decide to join us, we will be following up with further information on how & what to pack as well as any other essential information to ensure that you’re fully briefed and prepped for the trek. We’ll meet you early and from Suva head northwards along the scenic King’s Road and then inland to the rural village of Nabalesere. The drive takes about 3hrs (or 1hr45 from Suncoast). Once there you’ll sevusevu, a tradition to formally ask permission to be in the village and cross their land, and visit their stunning waterfall, where you’ll stop to soak up the ambience and go for a swim, followed by a cup of draunimoli (lemon leaf tea) and a late lunch back in the village. The walk to the waterfall is approx 30mins one-way, is steep in places and can be muddy. After lunch you head back to the King’s Rd and around to Tavua town, where the road takes you inland and uphill to your overnight accommodation in a local homestay. You’ll be well looked after by the family we stay with. The home has flush toilets and a cold-water shower. Meals are taken traditionally, seated on the floor and sleeping is shared with other guests, although there are some private rooms. 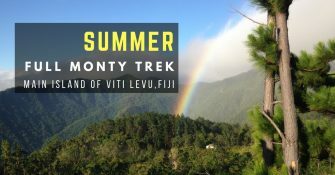 You’ll breakfast around 7:30am and aim to be walking by 8:30am on the track up Mt Tomaniivi. Guides from the village will look after you and you’ll have roti parcels to eat at the top. Mt Tomaniivi is Fiji’s highest mountain at 1,323m. The climb takes approx. 3 hours up and 3 hours down. The path is very steep in places, and can be muddy and slippery. Shoes with good grips are recommended. Care must be taken. On a clear day you’re rewarded with great views across much of the interior and the cloud forest around us is beautiful. This is also an Important Bird Area as designated by Birdlife International and you’re likely to hear and maybe see some of Fiji’s endemic birds. You’ll have a small afternoon tea in the village on our return. Then, after you get cleaned up, you’ll drive on to the village of Naga, about a 1hr further inland. Naga is a picturesque village at the end of the road. It has a mix of newer tin houses and traditional bures. This is where your walk starts from on Day 3 and is where you’ll spend the night. Sleeping is shared and will either be in a house or in the community hall. There are flush toilets and cold water showers, but be prepared for basic facilities. Once you’re settled in we’ll sevusevu, you’ll meet your guides for the next day and spend the evening with the community, chatting or playing cards. Dinner will be served in the community hall. This day of walking combines a great hike with a bit of cultural immersion. You’ll have breakfast around 7:30am and should be hiking by 8:30am. We’ll load your big bags into our vehicles to be driven the long way around. Remember to keep a sulu with you in your day pack. The village will provide roti parcels for lunch. You get great views as you stride out from the village and descend down to the river, and the old, abandoned village where the unfortunate Reverend Baker was eaten. A large flat stone, known as the “sharing stone” sits as a grim reminder. Following the river you pass another old village site, and several good swimming spots. If the weather’s good, you’ll hopefully have time to jump in. Eventually you start to climb up steeply from the river for 1.5km and arrive in the village of Nubutautau, where you will spend the night. The village hall will be yours to eat and sleep in. There’s also a traditional bure that is often available for your use. There are flush toilets and cold showers. We’ll be well looked after and following a sevusevu, and before dinner, we should have opportunity to hear the Rev Baker story in full. You’ll spend the night on the floor of the community hall or in the bure. It’s well padded with mats over dried reeds, and as with other nights mattresses and blankets are provided to add to the comfort! Today brings a solid day of walking, but ingeniously, apart from two notable climbs, it’s “mostly downhill”! It’s all about the early start, and you should be breakfasting by 7am. After breakfast, leaving your big bags in the village to be taken separately, you’ll get transported to the ridgeline above Nubutautau. From the ridge you strike out westwards with your guides across a battlefield and old village sites. Taking in a couple of tops and some amazing 360-degree views you slowly descend to the Ba river. The final stretch down to the river can be hot, as the sun is high and the breeze can drop. Once you reach the river you’re well passed half way and you should have time for a cooling swim before lunch provided by Nubutautau. You’ll then follow the river along the valley, with some rock scrambling and gentle winding paths, to a bridge near the village of Navala, and then a final 1.5km up the road to Bulou’s Lodge. The facilities at the Lodge are simple, with a dorm room, flush toilets and cold showers, but a good dinner and breakfast are provided and Tui the owner is a great host. After a leisurely breakfast we load up the cars and at approx. 9:30am head back to Navala village with Tui to take a look around. Navala is the poster boy Fijian village, with rows of neatly built traditional bures. After soaking up the atmosphere you’ll say goodbye to the highlands and head down to Ba and the coast. If you’re staying in Nadi we can drop you at your hotel, or transfer to a taxi if you’re staying on Denarau. If you’re heading to the Coral Coast or Suva, we’ll have a late lunch in Nadi before heading on. How fit do I need to be? Is the walking hard? Our itineraries cover a variety of levels of difficulty. The visit to Nabalesere and their waterfall is within most people’s ability. The track is 1.5km each way, with some up and down, but no time pressure. Other walks are more strenuous, but are within the ability of most people with good general fitness and a familiarity with hiking. Our longer itineraries should leave you feeling satisfying tired after a good day’s walking and a sense of achievement. The challenge of walking in Fiji comes from the heat, humidity, remoteness and the nature of the tracks, which are not constructed paths, are uneven and can become muddy and slippery. Is the water supply safe? There will be water at each night stop piped from local sources. Generally the supply is safe and is drunk by people living there. However, to reduce the chance of a problem we recommend you use bottled drinking water, filtered water supplied by us, boiled water or purification tablets if filling water bottles from any source, including taps in lodges and villages. We carry a supply of filtered water in our vehicles for refilling bottles. Lemon-leaf and lemongrass tea, using boiled water, is in plentiful supply in the villages, and with a bit of sugar added makes for a good energy drink! What facilities should I expect at our overnight stays? is on mattresses laid on top of soft traditional mats, sleeping spaces in bures or community halls are shared by guests on the trip. There are flush toilets and cold water showers. Lodges are similar, but are kitted out with beds and tables and chairs, and there are limited options for private rooms. Most villages we visit are fairly self-sufficient and meals generally consist of local produce from the surrounding fields. The ladies each provide a couple of dishes, and you’ll be able to choose from various bowls. Most dishes are vegetarian, but sometimes include fish. In villages, meals are eaten in the traditional way, sitting on the floor with food placed on a long mat or piece of material. Don’t be surprised by being told ‘kana vakalevu’, ‘eat more’. Please let us know if you have any dietary requirements. Are there any dangerous animals or plants? No. We’re lucky in Fiji that we don’t need to worry about poisonous snakes or spiders, or dangerous fish or crocodiles. There is a plant called the salato, which can leave you itching for weeks if you touch it, but it is very rare in the areas we walk in. The most annoying thing you are likely to encounter is the mosquito. Fiji is not malarial, and while there are occasional outbreaks of dengue fever, these are less common in rural areas, and the mosquito is less prevalent in the hills. Our advice… bring repellent and use it! What if I have a problem during the walk? A key part of the experience we offer is to get people off the beaten track and into Fiji’s remote interior. It’s therefore important for you to tell us prior to the trip if you have a pre-existing medical condition or take medication, and to let a guide know immediately if you have a problem during the trip. The guides walking with you have been 1st aid trained by St. John Ambulance and carry a basic 1st aid kit. Medication and supplies in the first aid kit are for your use, but it is your responsibility to know what stuff is and the correct dosage. At the beginning and end of each day there is road access and each trip has a dedicated support vehicle. In serious cases during walks, we can arrange for a horse to meet us on the trail, or in extreme cases we can call for helicopter evacuation. Please check that your travel insurance will cover you for an emergency evacuation. Our waiver is industry standard and is there to ensure that participants (or their guardians) are fully aware of the risks involved. These risks are nowhere near as extreme as diving, skydiving or bungee-jumping for example, but there are inherent risks in doing any activity outdoors, and unfortunately the waiver needs to emphasise the negatives. Safety is a pre-eminent concern for us, and we constantly seek to minimise the risks. However, there’s always the chance that someone will, for example, slip on the path and injure themselves. The waiver gives Talanoa Treks basic legal protection should such an accident occur. Importantly, the waiver does not mean that a participant cannot seek legal redress if they believe we have been negligent, and we have public liability insurance specifically for such an eventuality – although obviously we work hard never to be in such a position! Yes. All the communities that we work with are happy for you to take photos. However, you should always politely ask before taking photos of people or during a sevusevu (the traditional welcome ceremony). We also ask that when you take photos you do so in a sensitive way, and with particular thought to any photos taken of children. People always like to see the image you’ve taken on the back of your camera, and if you promise to send a photo please follow through! What about all my electronics? The lodges have mains power, but many of the villages do not have a dependable source. Please make sure you’re gear is fully charged at the start of the trip, turn phones to flight mode to save power (or take the opportunity to switch them off and forget about them for a few days! ), and if you’re worried you’ll run out of juice, pack a portable power pack. If you’re plugging into the mains, please use a surge protector. Please be aware that there is limited connectivity while we’re away, and no wifi hotspots. If you do charge up in a village a small contribution is appreciated. If you’re carrying electronics on walks, ensure you have somewhere waterproof to store them for crossing rivers and in case we get caught in a tropical downpour! We have a limited supply of dry bags, please ask if you’d like to borrow one. Do I need to worry about village etiquette? Part of the pleasure of our trips is experiencing authentic Fijian villages, which still hold custom strong, and this means we will ask you to observe village etiquette. However, you don’t need to worry about it. We’ll brief you fully. The key things to remember are to wear your sulu, not to wear anything on the top of your head, take your shoes off before going inside, and don’t stand up indoors if others are seated.